Last Saturday, I filled out some forms on which I was forced to write that come fall, our daughter, Laurel, would be a (gulp) … SENIOR in high school. (Personally, I think this is a very rude question for the form-making people to include—it’s far worse, far more painful, than someone asking me MY age!) As I sat at the kitchen table, I realized just how little time we had left with Laurel, that she’d soon head off to college, and then out into the world to make her own way. Suddenly, there was some optical leakage over those forms. 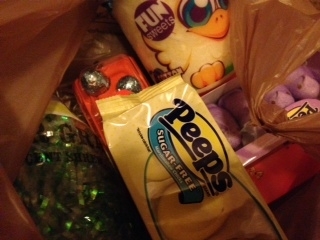 Which is why I had to go directly to my closet and break out the Easter candy hidden in there. Laurel found me sitting on the floor in my closet, covered in tears…and sugar. “Oh my gosh! What happened?! What are you doing?” she asked in a shrieky voice. I tried to calm myself and explain, but somehow trying to explain only made me more upset—I was practically squirting tears. “Mama, if you don’t stop this, after high school, I’m going to take a job at the nearest gas station and never leave home,” Laurel threatened. I immediately saw her point, took some deep breaths, and was able to calm myself. Which was good, because I had a cake to order and needed to be able to speak coherently. I was waaay beyond DEFCON Easter Peeps; I was at DEFCON Birthday Cake. So I called the cake people. “What would you like written on your cake?” the lady asked. 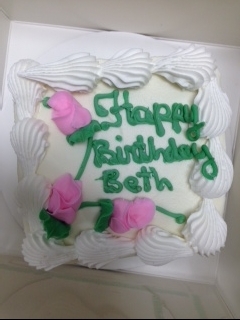 “Happy birthday,” I said, because what else do you write on a birthday cake? “Do you want a name on the cake?” she asked. Somehow I couldn’t quite bring myself to put my own name on the birthday cake (my birthday’s in July), so I gave her the name of a friend who’d had a recent birthday—and figured I’d eat the cake in her honor. I felt a little better after I’d ordered cake, but I still wasn’t able to exercise on Saturday. Because (for those of you who don’t know) exercise makes sad people sadder. Exercise is the exact opposite of Easter Peeps, birthday cake, puppies, sunshine and happiness. Come Monday, I was ready and so was my birthday cake. I picked up the birthday cake . . . and dropped it off to my friend, whose name was on the cake. I also doubled up on the exercise. Yes, it was hard. All of it. But I’m saving the big guns for when I REALLY need them. For now, I’m only at DEFCON lilies. 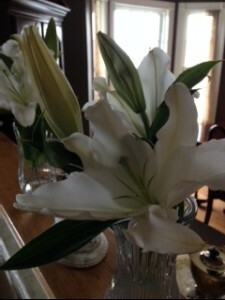 It’s not such a bad place to be—lilies make the whole house smell like heaven—and Laurel is still in it . . . so life is pretty heavenly.